Before there was Steve Jobs, there was Norman Bel Geddes. A ninth-grade dropout who found himself at the center of the worlds of industry, advertising, theater, and even gaming, Bel Geddes designed everything from the first all-weather stadium, to Manhattan's most exclusive nightclub, to Futurama, the prescient 1939 exhibit that envisioned how America would look in the not-too-distant 1960s. In The Man Who Designed the Future, B. 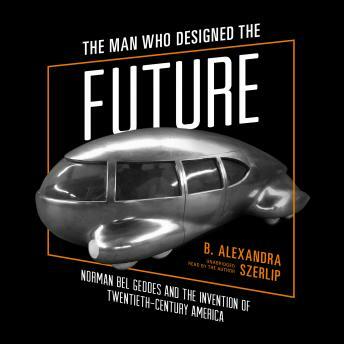 A. Szerlip reveals precisely how central Bel Geddes was to the history of American innovation. He presided over a moment in which theater became immersive, function merged with form, and people became consumers. A polymath with humble Midwestern origins, Bel Geddes was a visionary whose career would launch him into social circles with the Algonquin roundtable members, stars of stage and screen, and titans of industry. Light on its feet but absolutely authoritative, this first major biography of Norman Bel Geddes is a must for anyone who wants to know how America came to look the way it did.